4 standard USB ports allow 4 USB sync/data cables to be inserted at the same time and for you to simultaneously charge both devices. 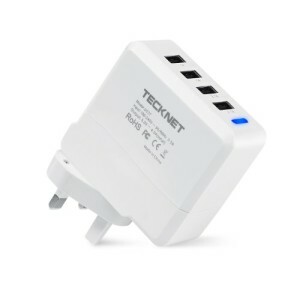 4.2A total output specifically designed for tablets/mobile phones – Best Replacement for Original Apple iPad USB Adapter or other USB charged devices. TeckNet® is a UK based company specialising in TeckNet branded consumer electronics.In the unlikely event that anything should go wrong with your TeckNet product, we provide a UK based warranty. You have the peace of mind that there’s no need to deal with messy non-UK company warranties that require product returns to Asia.4 standard USB ports allow 4 USB sync/data cables to be inserted at the same time and for you to simultaneously charge both devices.